Town and Concrete | Cyril Lancelin — theVisualVoices. Cyril Lancelin (born 1975, Lyon, France) is a French architect and artist. Graduated in 1999 with his architectural diploma, he collaborated for over fifteen years for internationally renowned Architects and Artists in Paris and Los Angeles, prior to launching his studio in 2016. Cyril uses primitive forms in his drawings and installations, making them the pillar of his work. Using parametric tools, he utilizes a vocabulary of classical shapes and volumetric spaces essential to creating unique structures. 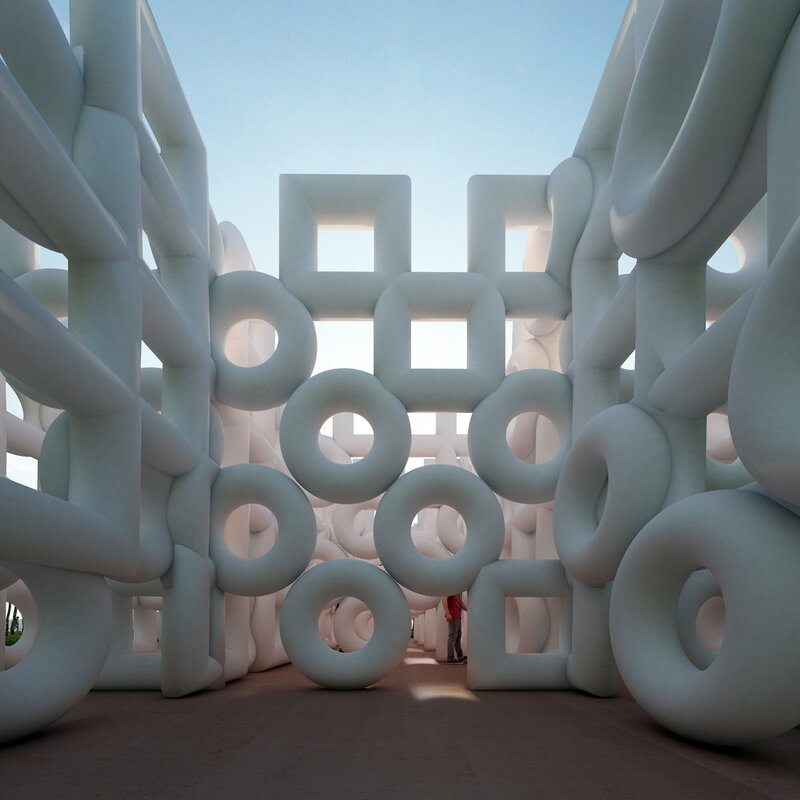 In his vision, shapes are used at the architectural scale to create experiential art. Last November, he presented his most recent “Knot”, an installation of monumental size 30m long and 8m high exposed in Hangzhou, China. 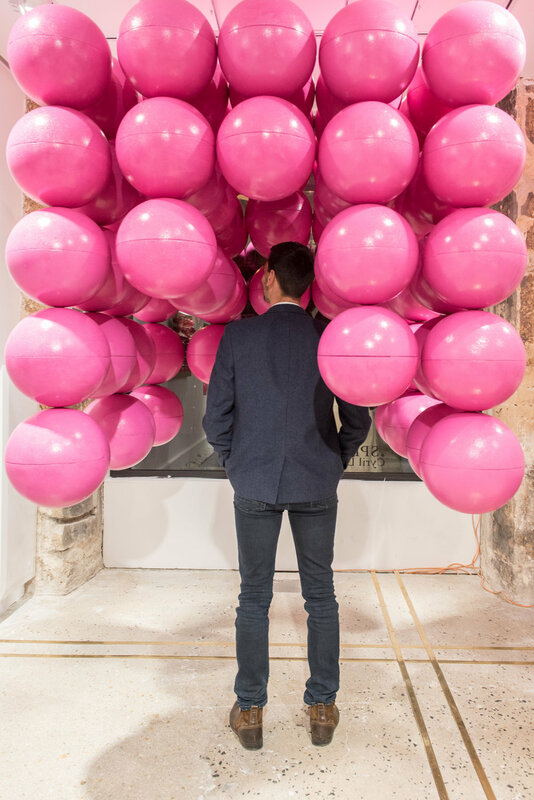 In April, he presented in a solo exhibition “spheres” at the Gallery MR80 in Paris, Half line and Cube sphere his two new immersive installations along with some new prints. In June 2018, one of his new installation based on Giant Flamingos will be presented in New York City on governors Island. Current new projects are underway in Lille, Moscow, Paris and California. Installation Chain has been inspired by the traditions of labyrinths. We begin with the most basic and profound form, a perfect torus - the circle in space. The artist Cyril Lancelin uses the torus to create a unique structural organization for contemplation & exploration. He mixed it with square shape. The plan is a simple grid. The design was made with parametric tools, to find the right scale. The artwork is designed to draw the visitor in; it is more than an object to view, it is a place to be experienced. Classical design meets contemporary thinking in a work that invites Social Media and delights traditional media. Installation Chain is created as both a work of fine art and as an attraction to transform public space and delight audiences of all types & ages. Installation Mix has been inspired by still life paintings. In his research and his work on the multiplication of primitive forms to establish partitions, the artist used here as basic element melons and other fruits. Those are part already of the pop culture, their skin is very graphic and has inspired lot of artists. In installation “Mix”, they are used as a construction material, of course, they are fakes ones, their scale is a little bit larger to procure an immersive experience in an unreal space. They are distributed on inverted pyramids, so as to create a labyrinth of different spaces. Visitors are invited to walk the installation, they are the spectators immersed in the still life. Installation Mix is created as both a work of fine art for amazing images and as an installation for visitor’s experiences. This exhibition of those three primary volumes is a work about immersive sculptures. It’s not only the sculpture but also the relationship between the sculpture and the visitor. You can get inside the sculpture, you become part of it and interact with other visitors. Those works as a cabin, little rest area, where the surrounding is unusual. The show is inside, but outside too, visitors are spectators of the people getting inside the sculptures. The light too is coming inside the artwork, playing with the volumes and the soft shadows of spheres. The design was made with parametric tools, to find the right scale for the spheres, in order to make a compact volume. Primitives volumes such as Cube, Pyramid, and Spheres are made with other primitives, the spheres. The spectator has to feel the volume, the empty and the full. This installation fills a volume and compartmentalizes it into different spaces. It becomes a labyrinth with passages and places. This installation is based on a knitting node, the trefoil knot, a primitive form on which the design of the 3-dimensional structure is modeled. The trefoil can be obtained by joining together the two ends of a common overhand knot, resulting in a knotted loop. The trefoil is named after the three-leaf clover (or trefoil) plant. Several nodes have been juxtaposed, and a continuous and closed line connects them. This immersive installation makes it possible to explore different spaces separated by unusual separating boundaries. You have to bend down, step over, go around to get around. The pink color very present will allow the work to be detached from its environment. Its general volume is very easily identifiable by the presence of this colored mass. This architectural exploration, we learn about alternatives to simple partitions to delimit several spaces. This installation could be the partition and the structure of a building. 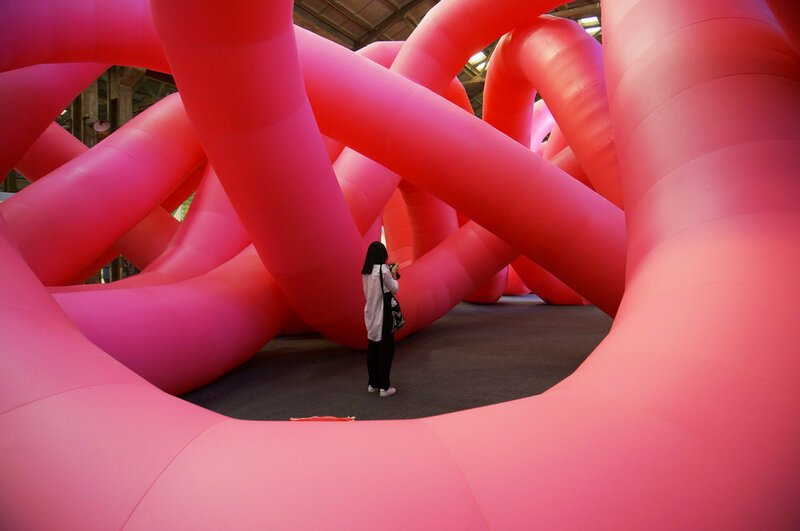 The variety of node loops allows the installation to have a variety of explorations. She visits herself, but she also looks at herself with an outside eye. The experience is inside but also outside, and especially from all angles. The node is an assembly, the installation is a node. For more information, visit townandconcrete.com.